World of Tanks is a massively multiplayer online game that features World War II era fighting vehicles. 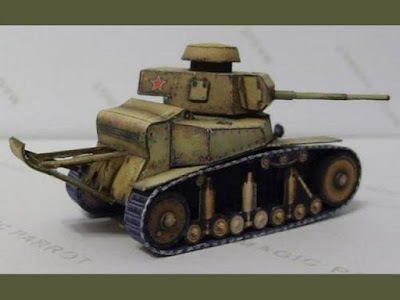 This Soviet MS-1 tank is one of several paper models released by the makers of the game. A PDF of the printable template for the tank may be found here (click on the red text beneath the photo). You will notice the instructions for the model are in Russian, which is understandable given the developer of the game is based in Russia. As far as I know, the template is not available in any other languages. The MS-1 was also known as the "T-18 light tank". 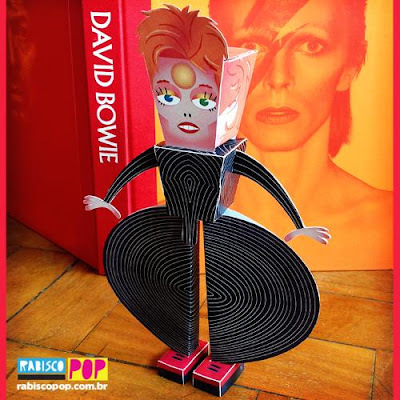 As bizarre as this David Bowie paper toy may seem, it replicates an outfit Bowie wore in 1973 as part of his Ziggy Stardust persona. Bowie's Ziggy Stardust tour in the early 70's is considered by many to have been the creative force that propelled the artist to fame. This tribute paper toy was created by Vic Matos and may be downloaded here. I was watching Mad Max: Fury Road this week and got the itch to post some Mad Max papercraft! 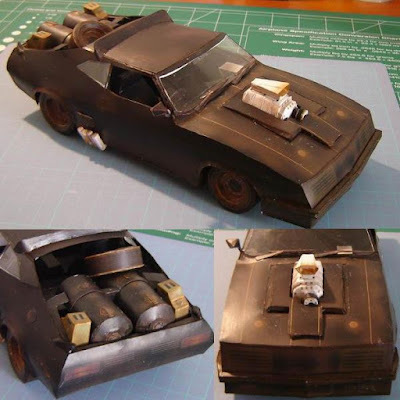 I consider this 2007 paper model of Mad Max's car to be one of the best renditions around. The model was created and built by Claudio Dias. A free download of Claudio's template may be found here. The real life car used in the Mad Max movies was a customized 1973 XB GT Ford Falcon coupe (a car that was sold only in Australia). The car is usually referred to as an "interceptor" because it was Mad Max's police car in the first film in the series. Wyverns often appear in English, Scottish, and Irish heraldry. The technical definition of a wyvern is "a winged two-legged dragon with a barbed tail". 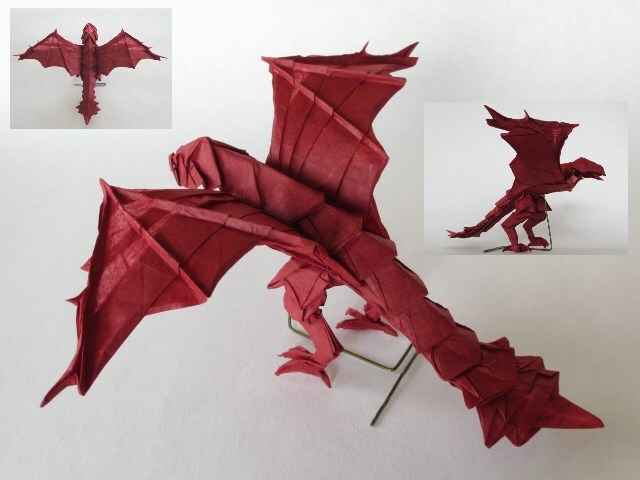 This origami wyvern was folded from a single 12" square of paper by DeviantART member, Cahoonas. I especially like the design of the wings! The crease pattern for the wyvern can be found here. I can barely remember seeing reruns of The Munsters on television when I was just a tot. Both their house and car were truly unique! Now, with much attention to detail, card model designer Dave Winfield has recreated the Munster's home and car in paper. 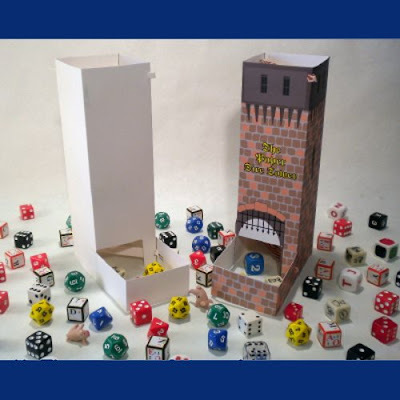 Free papercraft templates for the models may be downloaded from Dave's webpages here and here. The original "Munster Koach" (as the car was named) was designed by George Barris who also designed the 1966 Batmobile. 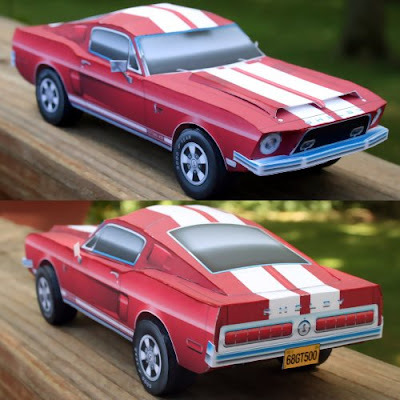 This papercraft car is a 1968 Mustang Shelby GT500KR fastback. The Shelby Mustangs of the 60's were a high performance variant of the Ford Mustang built by American automotive designer Carroll Shelby. 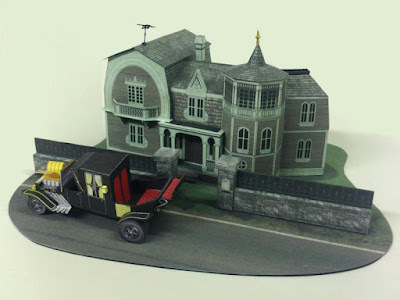 The paper model was designed by Papercruiser.com as a promotional item for a Ford parts dealer. The free PDF template for the model may be downloaded here. If you are in the mood to build a more recent Shelby Mustang, check out the 2008 GT500 previously posted here. 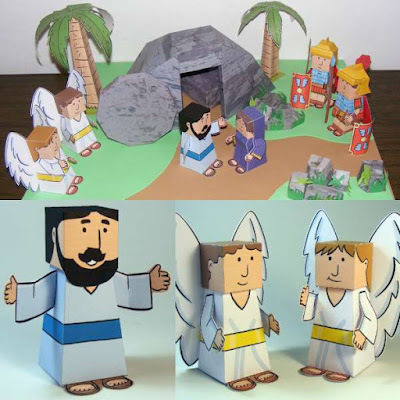 The digital models in certain video games lend themselves really well to the creation of paper model templates. Such is the case with the Zoo Tycoon video game. These papercraft zebras are based on 3D models from the game. Printable JPG templates for the zebras may be downloaded from the DeviantART page of DrWheelieMobile. Zoo Tycoon was first released in 2001, with the most current version of the game to date being released in 2013. ASIMO is a real life robot designed by Honda. ASIMO stands for "Advanced Step in Innovative Mobility" and true to his name, he can walk. 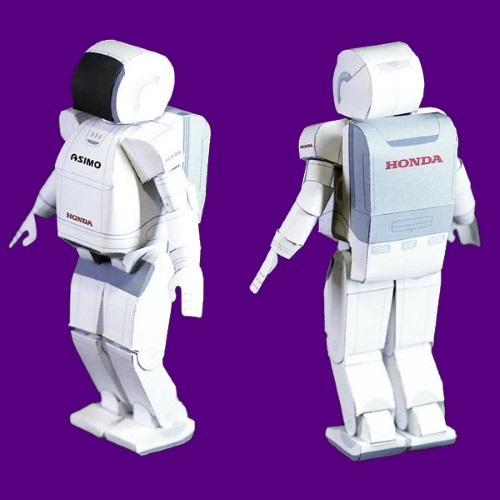 To promote knowledge of the robot to children, Honda offers a paper model download of ASIMO. The model is available in four different color schemes. The gray version is pictured here. ASIMO was introduced by Honda in October 2000.